Viking River Cruises' "Chateaux, Rivers and Wine"—a voyage through Bordeaux. All photography unless noted is the property of EuroTravelogue™. Unauthorized use is prohibited. After the extraordinary Viking christening in Avignon the previous day, we were whisked off from Marseille to Bordeaux for our 4-day preview cruise of Viking River Cruises' brand new itinerary—"Chateaux, Rivers and Wine," a voyage through the heart of Bordeaux—celebrated chateaux surrounded by undulating hills of verdant vineyards, followed by wine tastings of some of the finest vintages in the world! 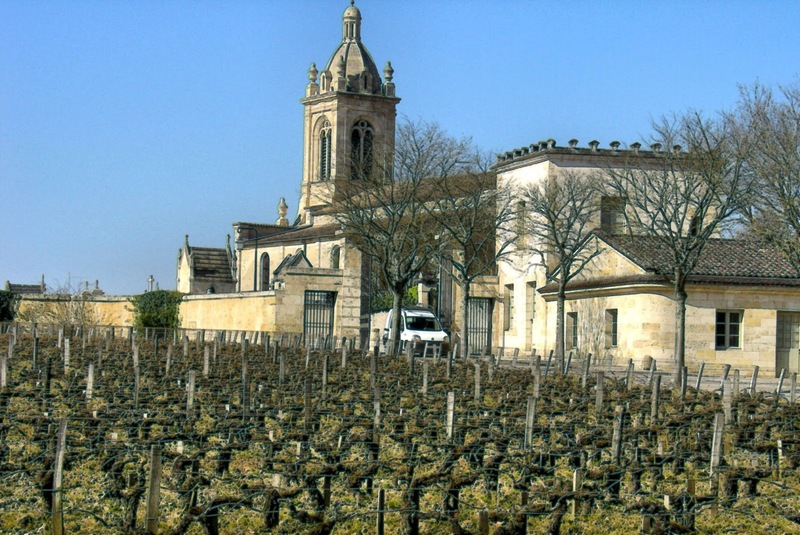 Join me on the wine trail and river cruise through sumptuous Bordeaux! In true Viking River Cruises fashion, the new Chateaux, Rivers and Wine itinerary met and exceeded every expectation I had for the culturally-enriching experience that Viking consistently delivers on every cruise I have sailed to date. Not only did we tour some of the most famous chateaux and taste extraordinary wines—including the most expensive, we gained valuable insight into the art of winemaking—from the viticulture and viniculture (from vine to wine), to the rich traditions and heritage of the Bordeaux chateaux—undeniably a delicious feast for all senses! And it gets better because acclaimed wine expert and Godmother Susie Barrie who christened our Viking Heimdal the previous day, was onboard our river cruise through Bordeaux. Did I mention that she also happens to be a Master of Wine, one of only 312 in the WORLD? 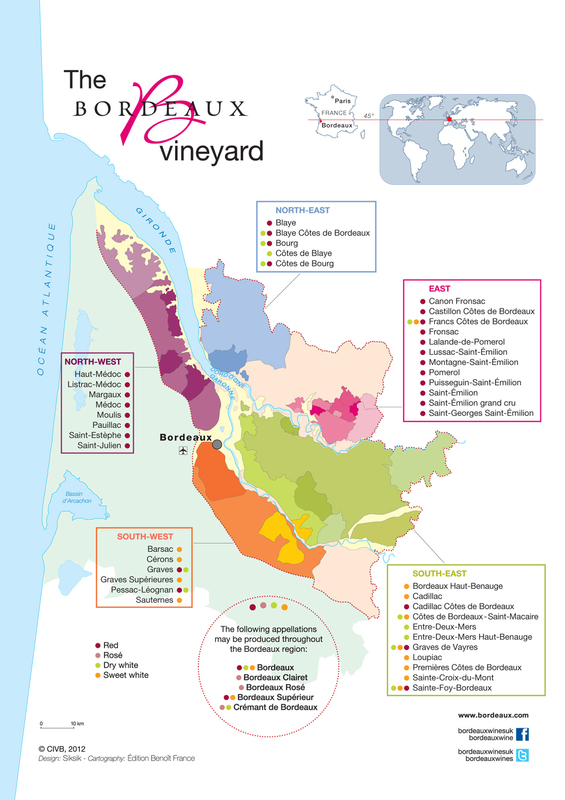 Bordeaux Map. Courtesy of Bordeaux.com. The Bordeaux region of France, home to more than 8,000 chateaux and renowned for its Sauvignon Blanc, Cabernet Sauvignon and Merlot, is geographically defined by the three rivers that traverse its terrain: the Gironde, Dordogne and Garonne. The Gironde, actually classified as an estuary as opposed to a river, flows into the Atlantic and bisects Bordeaux into the "left bank" and "right bank," geographical areas that you will get to know shortly because of the types of soils found in each that dictate the grape varietals that are cultivated. Down river, just beyond Blaye, the Gironde splits into the Dordogne and Garonne—the former extends east toward Saint-Émilion and Pomerol and the latter stretches south to the cities of Bordeaux and Cadillac. 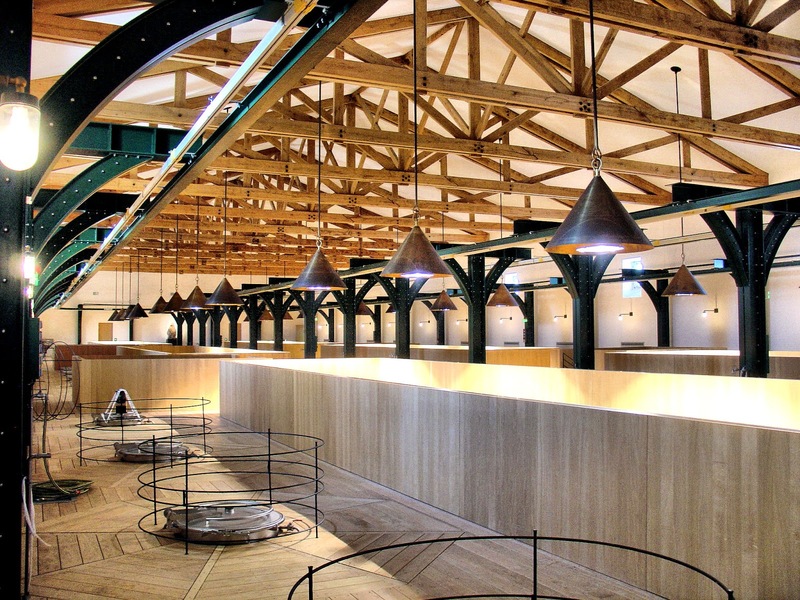 And surrounding these French waterways are the fertile lands that have produced some of the world's finest wines for centuries. 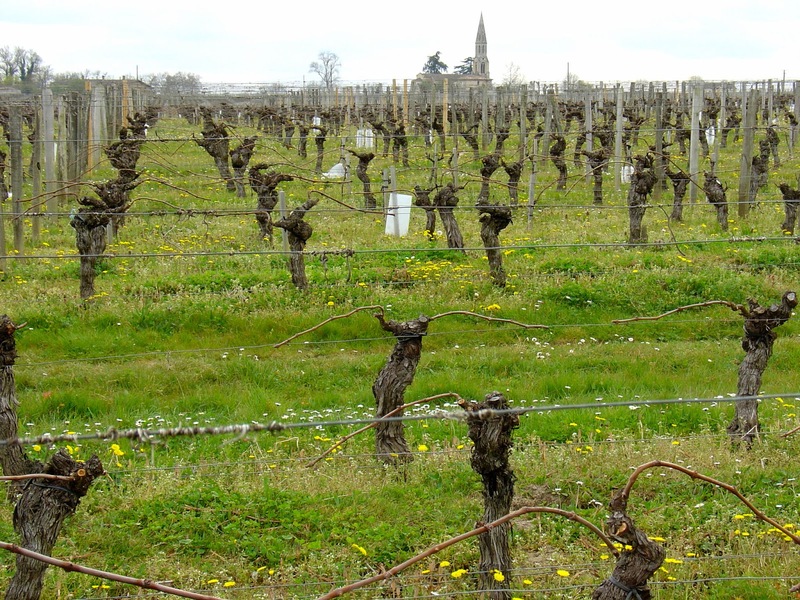 The Left Bank—home to the Médoc and Haute Médoc regions in the north and the Graves and Sauternes regions in the south—contains fast-draining gravelly soils that Cabernet Sauvignon grapes thrive upon. On the opposite shores, the Right Bank contains predominantly limestone and clay resulting in the increased moisture retention that the softer Merlot grapes prefer. Did you know that most of the red wines produced in Bordeaux are actually blends from the juices of the grape varietals? By varying the amounts of Cabernet Sauvignon, Merlot and Cab Franc predominantly, sometimes Malbec and Petit Verdot but in smaller quantities, the viniculturists produce the region's best wines. For those white-wine fans, me included, you'll find wonderful Sauvignon Blancs as well as the sweet Sauternes dessert wines. The chapel behind the Château Prieuré-Lichine. You've probably heard them before, terms associated oenology (the science of wine making) including terroir, appellation, classified growth and vintage—among many others but what do they mean how do they affect the finished product? How to read the wine label. This photo only: WikiMedia.org. Terroir is the specific location of a vineyard—defined by its geography, geology and climate. It is the amalgamation of these attributes that embodies the terroir and ultimately the flavor of the wine; and it can dramatically affect the flavor of identical blends of wines as well. Much to my astonishment after tasting two vintages from the Château Siaurac near Saint-Émilion that were comprised of 80 percent Merlot and 20 percent Cabernet-Franc grapes, we discovered, thanks to owner Paul Goldschmidt, that the only difference in these two very distinct flavors was due to their terroir. AOC: or Appellation d'Origine Contrôlée refers to the designated place of origin as defined by the French government. Its purpose is to identify and protect specific wine-producing areas based on their terroir. 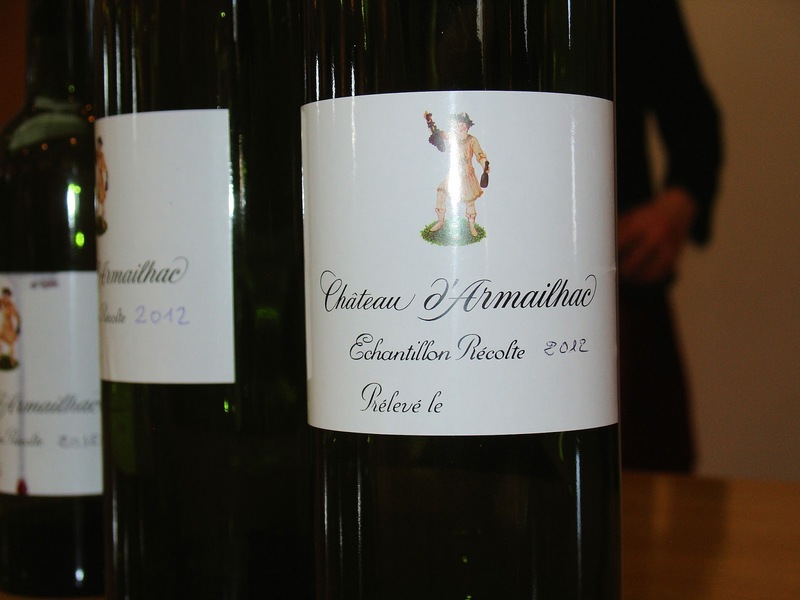 Currently, there are 57 appellations in the Bordeaux region and you'll find them printed on the wine labels as well. Let's journey back to 1855, to the Paris Exhibition when Emperor Napoleon III requested that wine brokers from the Bordeaux region develop a classification system for region's best wines. Referred to as the Bordeaux Wine Classification of 1855, the best of Bordeaux's vintages were classified into five categories: First-, Second-, Third-, Fourth- and Fifth-Great-Classified-Growths or Premier, Second, Troisième, Quatrième and Cinquième Crus Classés within the overarching Grand Cru Classé distinction. 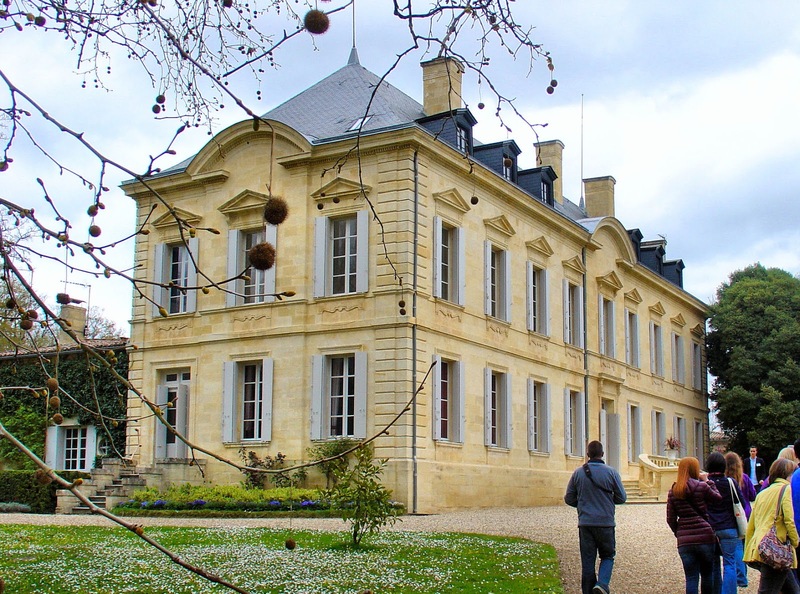 Of course, every chateau wants to grow up to be a Premier Grand Cru Classé but only a selected few, five as a matter of fact, are worthy of this the grand title and we were lucky enough to tour and taste the vintages from one of these—Château Mouton-Rothschild! Vintage actually refers to the year in which the wine was made, not the year in which it was bottled. In between—aging nicely in oak barrels. Our first day of touring on the Bordeaux wine trail was through the Médoc region on the Left Bank. Our first stop is the Château Prieuré-Lichine in the south and then Château Mouton-Rothschild to the north. Along the way, we stopped for a moment at the renowned Château Margaux, one of the five prestigious Premier Grand Cru Classé chateaux that I mentioned above. 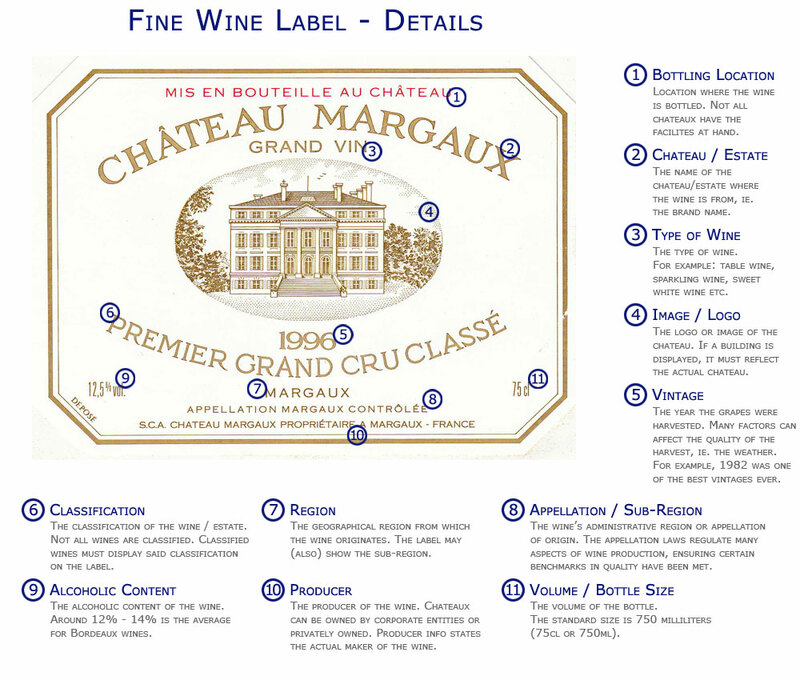 Bienvenue a Chateau Margaux—a Premier Grand Cru Classé or First Great Classified Growth. The house on the grounds of the Château Prieuré-Lichine dates back to the French Revolution. 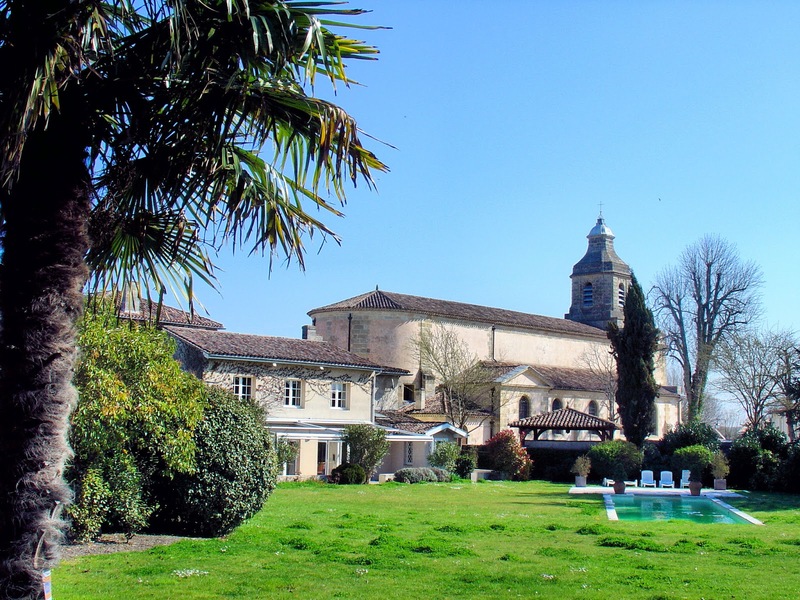 Located in Cantenac where the Gironde splits into the Garonne and Dordogne rivers, the Château Prieuré-Lichine sits on the Margaux appellation and dates back to a 15th-century priory of Benedictine monks who cultivated vineyards and founded the estate. Since then, the property changed owners numerous times until Alexis Lichine purchased the property in 1951 and added his name to the chateau. Today, the Ballande family owns the estate and carries on the traditions of producing the chateau's four vintages: Château Prieuré-Lichine, a fourth great classified growth wine; the Confidences de Prieuré-Lichine; Clocher du Prieuré or "Clocker of the Priory;" and finally one white, the Blanc du Château Prieuré-Lichine, a blending of the 60 percent Sauvignon Blanc and 40 percent Semillon. 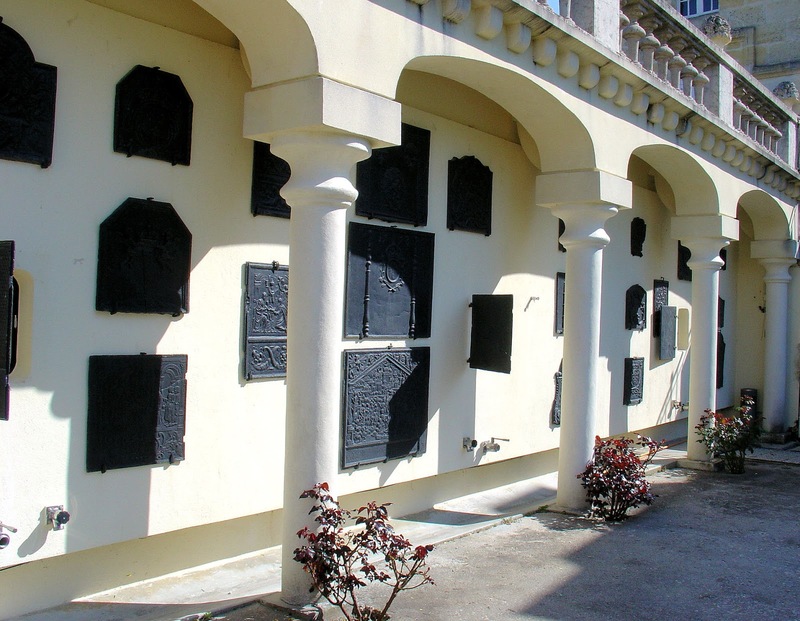 Lichine's personal collection of 150 fire place back panels decorate one of the exterior walls of the chateau. 100-hectoliter concrete vats line both sides of the room at the chateau. 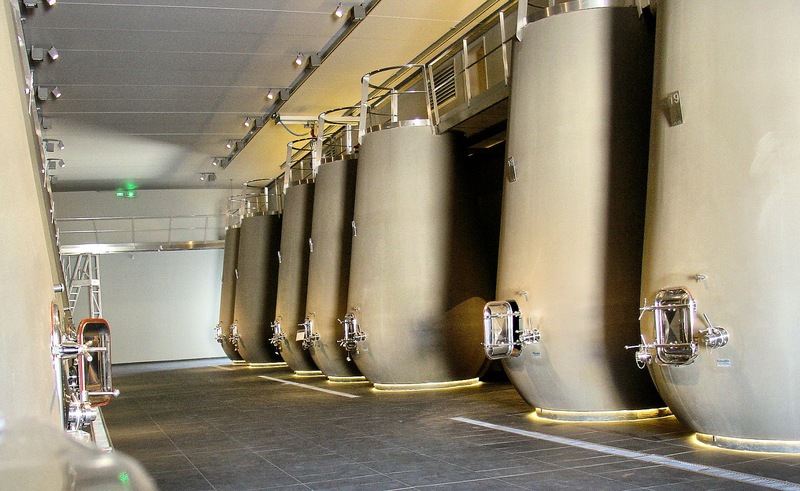 Each contains 2,642 gallons of wine! 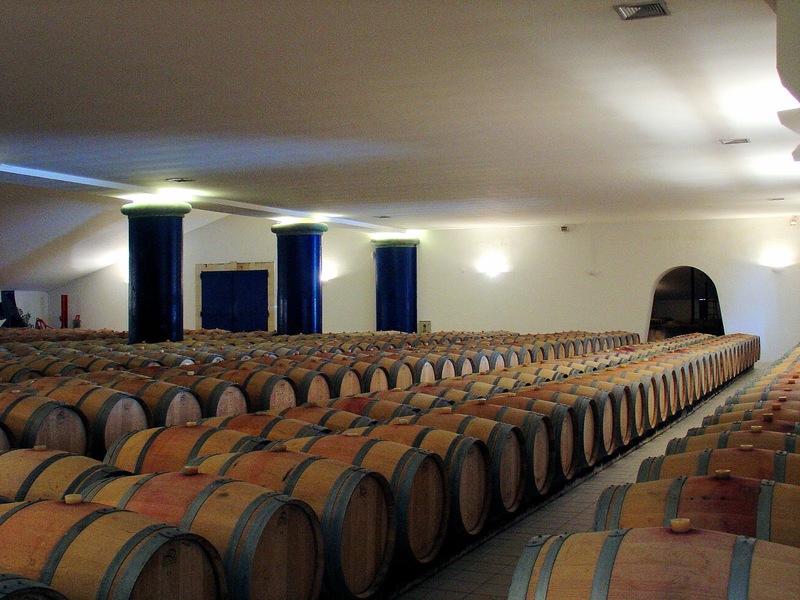 The barrel room where the wine is stored and racked (a process of transferring aging wine from one barrel to the next to eliminate the sediments). 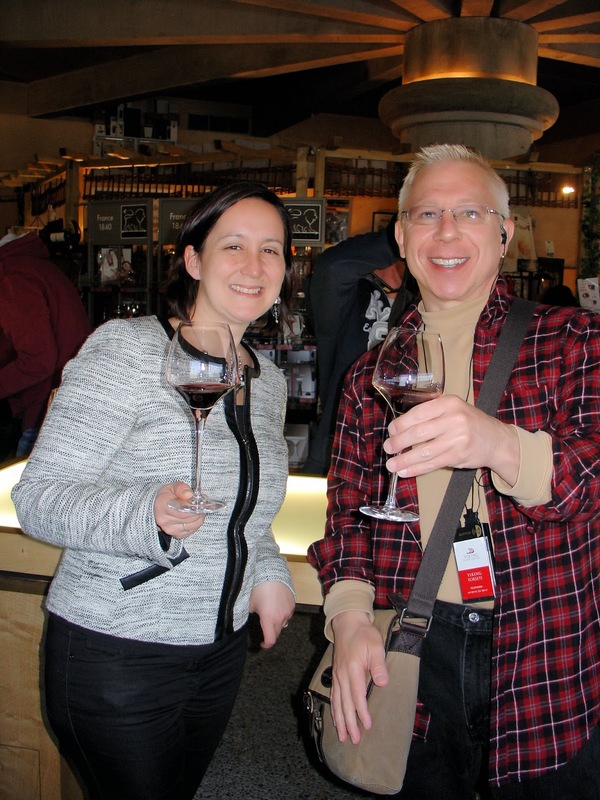 At the end of the tour, we tasted the chateau's three vintages. 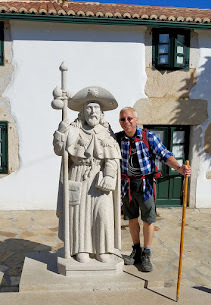 Here I am with our guide, Lætitia Guix de Pinos. Here is Lætitia Guix de Pinos with Karine Hagen to explain tasting the Bordeaux reds and whites! Fascinating indeed! Our tour of the chateau's grounds included the house that dates back to the French Revolution, Lichine's personal collection of 150 fire place back panels, the vat and barrel rooms, and finally a tasting of the chateau's superb vintages. Before heading to our next stop along the Bordeaux wine trail, we stopped for lunch at the charming Café Lavinal, a quaint French bistro in Pauillac. After our scrumptious victuals, we were off once again and heading north to the Pauillac appellation and the sprawling estate of Château Mouton-Rothschild. Verdant vineyards stretch to the horizon at the Chateau Mouton-Rothschild. 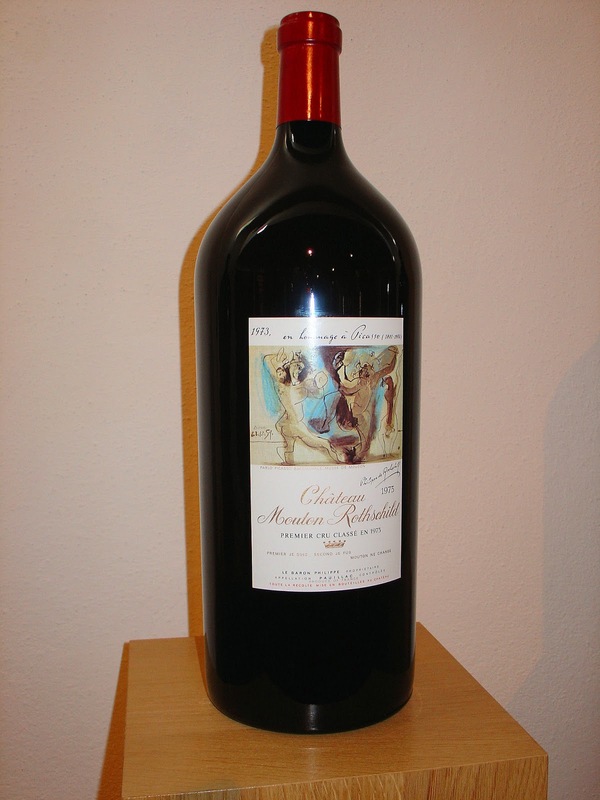 Photo: Courtesy of Chateau Mouton-Rothschild. Unauthorized use is prohibited. 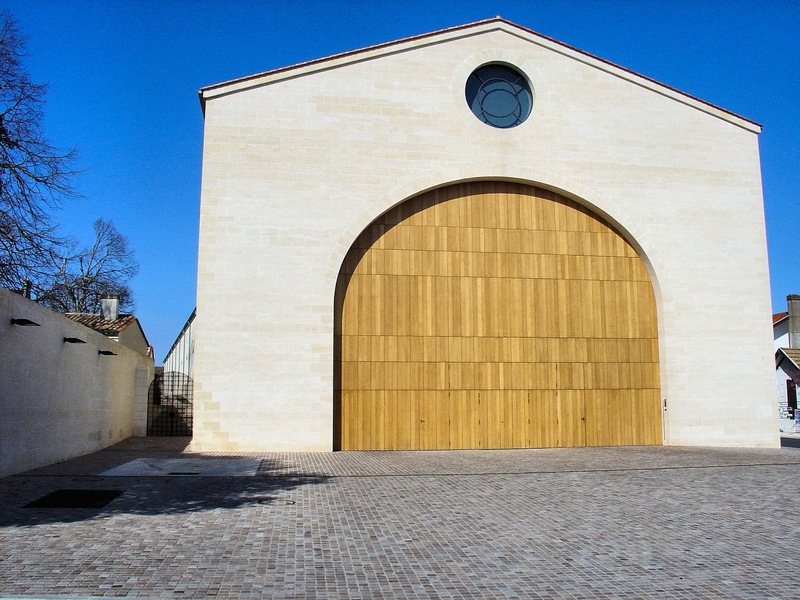 What began as a mere investment in a neglected Bordeaux chateau back in 1853 has matured into one of the most highly-esteemed wineries in the world—Château Mouton-Rothschild—producer of one of the five Premier Grand Cru Classé vintages mentioned above. Upon our arrival, you can't help but be overwhelmed but extremely impressed by the sheer size of the estate—sprawling vineyards that stretched as far as the eye could see. 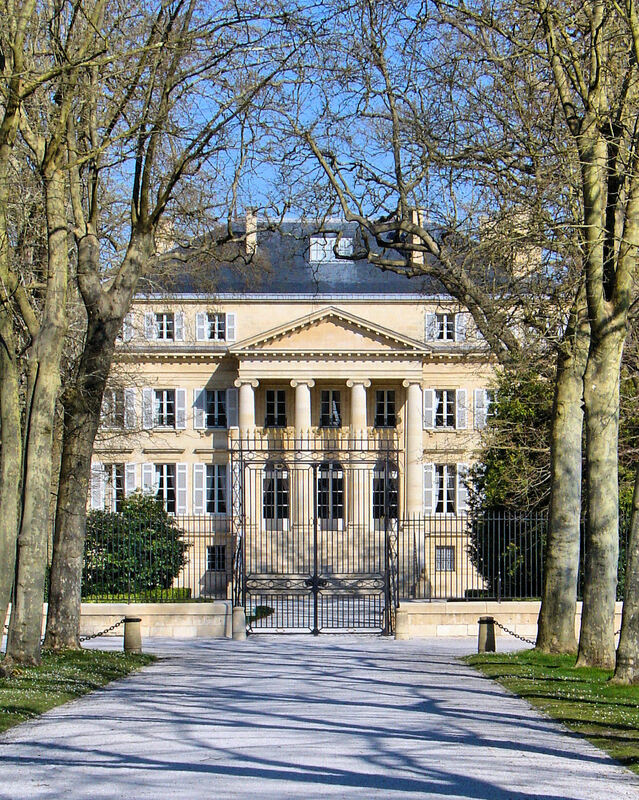 Born of the Rothschild banking dynasty in London—the château has a remarkable history after its humble start but thankfully, Baron Nathaniel de Rothschild, grandson of Mayer Amschel Rothschild who was responsible for the family's rise to international prominence in the mid-18th century, had a vision to transform a rundown chateau into one of the finest in France and the world for that matter. When great-grandson Baron Philippe de Rothschild took over the chateau in 1922, he began bottling at the estate just two years later. [To find out if a wine is bottled on site, look for mis en bouteille au chateau on the label.] At that time, the chateau was still designated as a second great classified growth, the chateau's status since the 1855 classification but all of that changed when finally, in 1973, after the persistent lobbying efforts of Baron Philippe, the chateau received its long-overdue promotion to Premier Grand Cru Classé. Wine production at the chateau begins here at the vat house and processing facility. Look carefully to the left of the photo and you'll see it that this building extends quite a distance. Inside just one section of the vat house. The stainless-steel lids at the left lead to the huge vats below. From vine to wine! 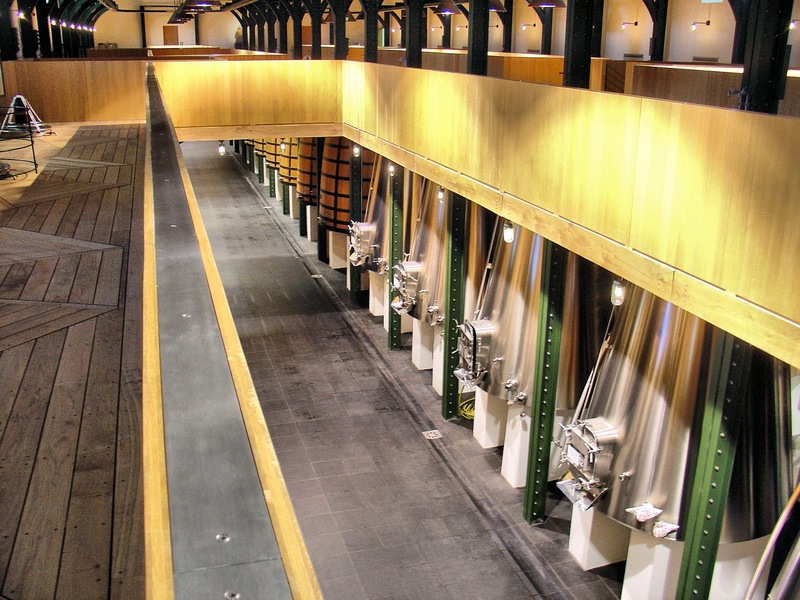 Here are the stainless-steel and oak vats near the back. 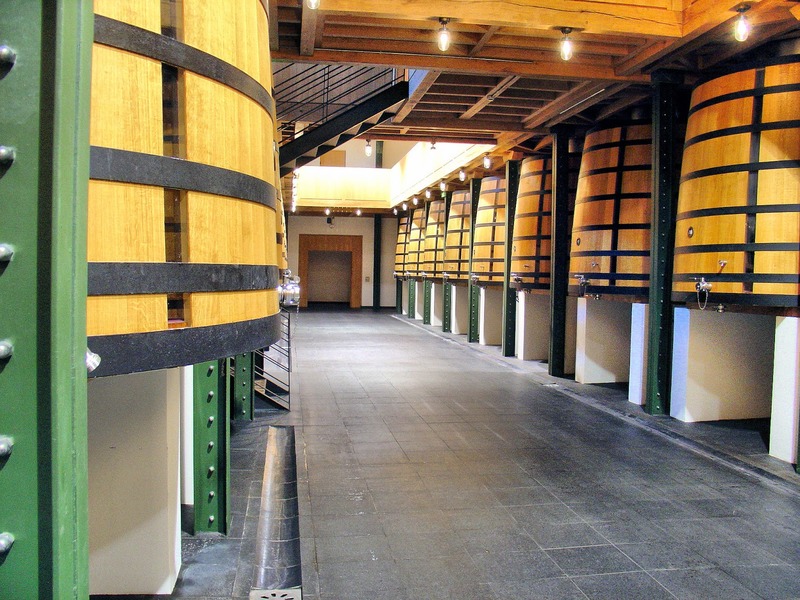 Huge oak barrels are where the grapes begin their transformation into a the Premier Grand Cru Classé Chateau Mouton-Rothschild. Chateau Mouton-Rothschild magnum from 1970. Original Chagall artwork decorates the label. Inspired by the 1945 Allied victory of WWII, Baron Philippe established the tradition of decorating the label of the chateau's premier vintage with an original piece of artwork by a contemporary artist of the day. Since it was year of victory, Baron Philippe intended to celebrate the return of peace and so he commissioned a piece from an unknown artist, Philippe Jullian (1921-1977), who submitted many drafts until finally, a painting that featured a predominant "V" surrounded by olive branches and inscribed with the words "Année de la Victoire" was selected. And so, a new tradition was born at the chateau and every year since, a new piece of artwork has been commissioned to decorate the venerable Château Mouton-Rothschild. Some of the artists who produced works for the vintage include: Cocteau, Dali, Chagall, Enri, Warhol—among many others. View them all at Chateau Mouton-Rothschild.com/DiscoverTheArtwork. Homage to Picasso adorns the 1973 vintage of the Chateau's Premier Grand Clu Classé. The new millennium was the only year that an artist was not commissioned to decorate the label. The design was inspired by a piece in the Chateau's Museum of Wine in Art, the “Augsburg Ram,” a silver-gilt drinking vessel created circa 1590 by Jakob Schenauer, a German master goldsmith. A special enameling process was developed to produce the bottle's texture and luster. After our tour of the brand new production facility built in 2012, we were led into the Museum of Wine and Art which opened on the grounds in 1962. Here, all of the original works of art from the labels as well as countless other artifacts comprise a collection now on display for public viewing. No photography please, except for the bottles themselves. 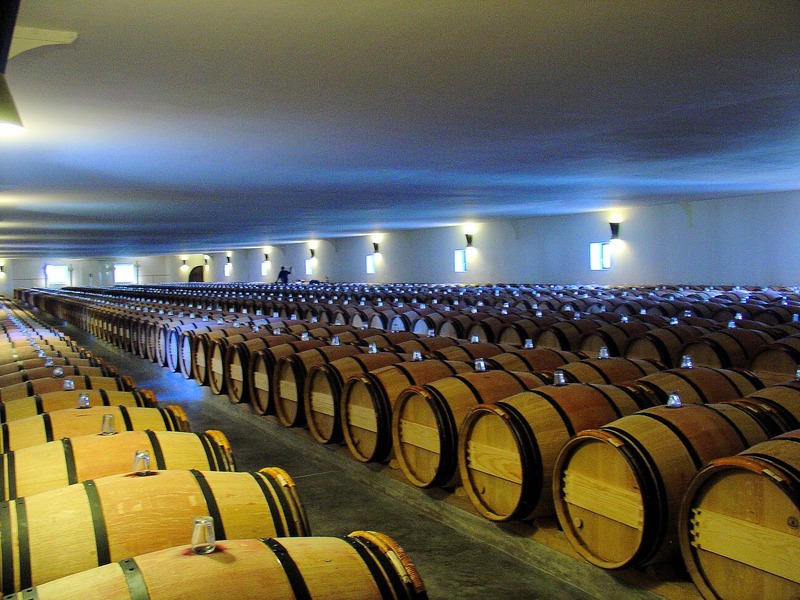 Barrel room at the Chateau Mouton-Rothschild. In 1988, Baroness Philippine, Philippe's only child, inherited the Château Mouton-Rothschild and ended her acted career. Today, she and her two sons manage the estate. All guests are introduced to the Baroness in a short, multi-sensory film at the beginning of the tour. Not only do you watch and listen to her introduction of the family, chateau and wine production, the air is infused with the fragrances of the vineyard, even the dirt—truly fascinating. Another sublime tasting at the Chateau Mouton-Rothschild. Cheers from me and our guide! We ended our tour with a wine-tasting of the chateau's three vintages: Château Mouton-Rothschild Premier Grand Cru Classé, Le Petit Mouton de Mouton Rothschild and Aile d’Argent. 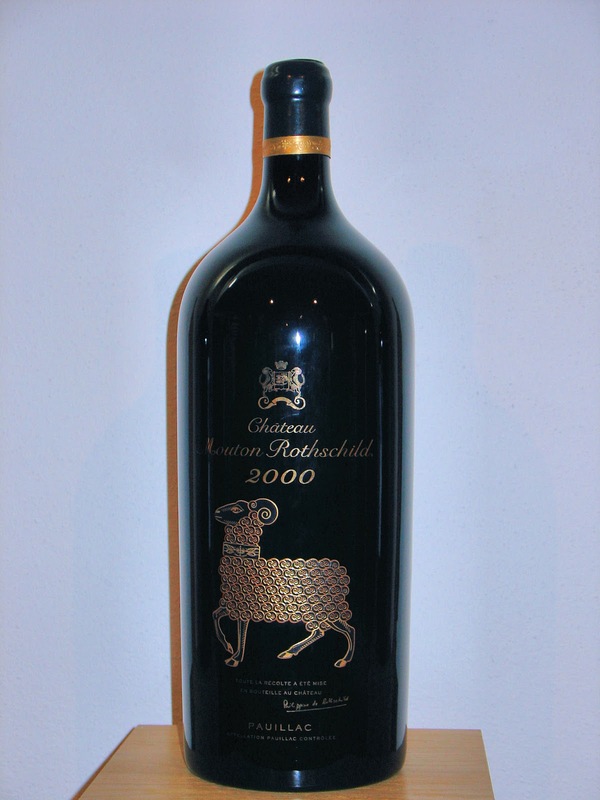 Have you priced a bottle of Château Mouton-Rothschild? 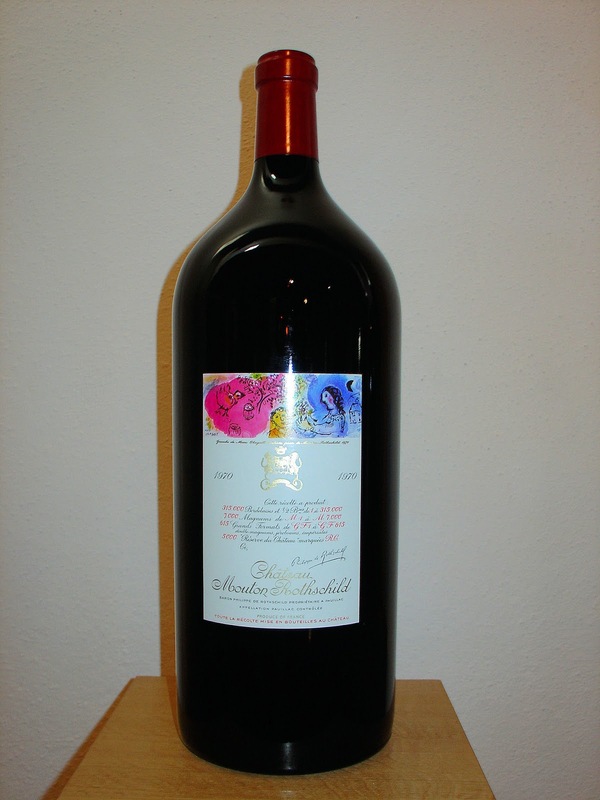 I was in awe when I saw a price list that included a 1945-bottle of wine priced at €29.000 or $40K. That night back onboard our Viking Forseti, we were treated to a wine presentation by Master of Wine Susie Barrie who introduced us to the fine art of wine tasting. First, you examine the color. Second, breathe its aroma. Third, taste the wine with a proper "chewing" and "swishing" to really bring out the flavors. Following our brief lesson, we proceeded to taste a 2012 Sancerre from the Loire Valley, followed by an Oak Chablis, Pinot Noir and finally a Cabernet Sauvignon. At the end of the presentation, Susie tested our knowledge and I am sorry to say I didn't do well. Back to "Tasting 101" for me! Elegance and opulence come to mind when admiring the early 19th-century Chateau Siaurac located in the Pomerol appellation on the right bank. Currently the chateau is undergoing a major renovation to restore its grandeur! The following morning, we docked in Bourg on Bordeaux's Right Bank, and after lunch, our wine trail led us to Château Siaurac in the Pomerol appellation. Currently undergoing a major restoration, the 1832 chateaux was exquisite to say the least despite the work being done on the interiors as we moved through the villa. Originally owned by the Brisson family in the early 19th century, it is one of their descendants, Aline Guichard who with her husband Paul Goldschmidt manage the estate today. We toured the gardens and the vineyards and ended with a wonderful tasting of the chateau's three vintages produced in the Pomerol and Saint-Émilion appellations. Accompanying each glass of wine, a tasty morsel cheese and bread to cleanse our palates, and fill up our tummies too! 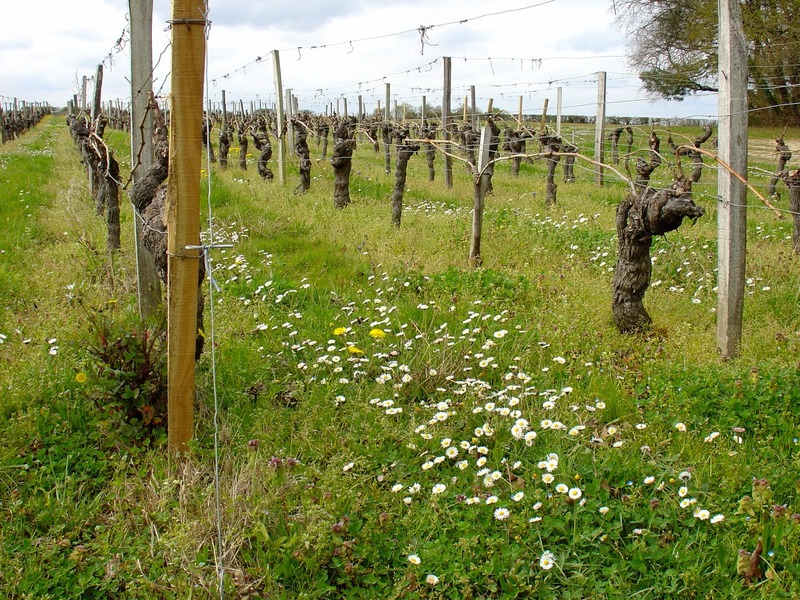 It is here where we learned of the significant impact that the terroir of the vineyard can have on wines of the same blends as I mentioned above. 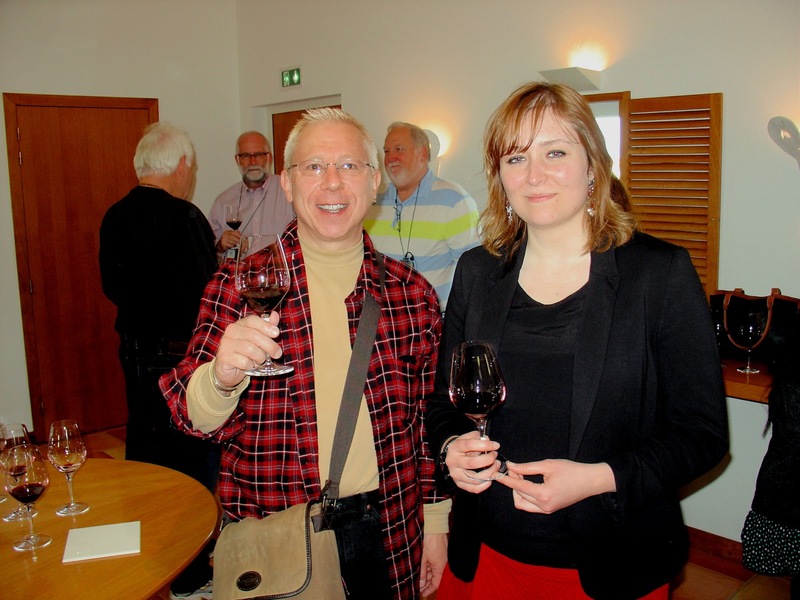 We learned a great deal about viticulture (wine cultivation) during our visit. The two strands of vine that you see extending from each of the aged trunks are carefully selected by experts for their potential to foster the best growth of the vine. Constant vigilance prevails at the vineyard and their growth is carefully monitored at all stages of maturity. If the viticulturists determine that the grapes won't ripen in time for harvest, the vines will be pruned and stripped of their leaves to allow the sunlight to ripen the fruits. 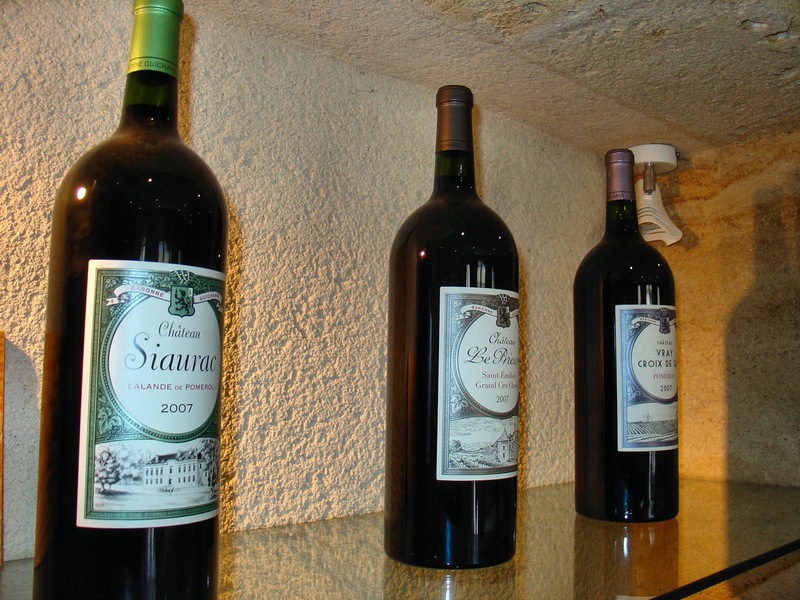 The Chateau Siaurac's vintages include Chateau Siaurac, Chateau Vray Croix de Gay and Chateau Le Prieuré. Our final Bordeaux tasting at the Château Siaurac. Here with owner Paul Goldschmidt. I hope you enjoyed our river cruise through Bordeaux and our wine-trail journey through some of the most prestigious chateaux of the region. I honestly don't know how Viking does it but like all the cruises I have been on to date, Viking delivered yet another culturally enriching and immersive experience in the heart of Bordeaux. Although my cruise was an abbreviated version of Viking's new 8-day Chateaux, Rivers and Wine itinerary, I managed to learn a great deal about the culture of wine in Bordeaux—the heritage, the history, the legacy! 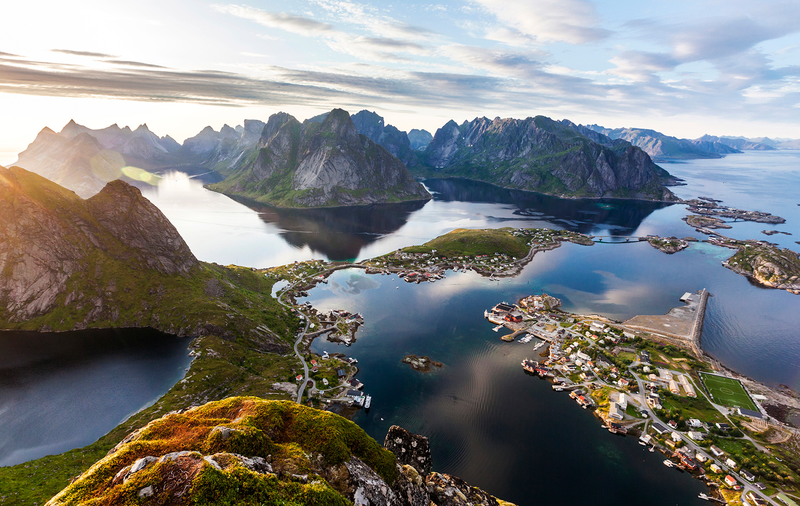 Wherever my travels take me, I hold true to my personal philosophy—savor the journey as well as the destination! 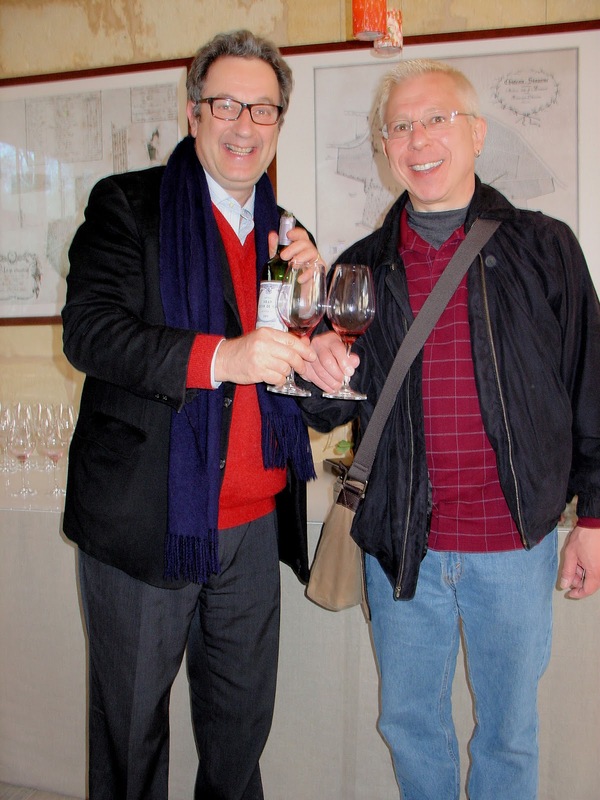 I am still savoring Bordeaux! Special thanks to Viking River Cruises for inviting me on this preview of the new "Chateaux, Rivers and Wine" river cruise in Bordeaux. It was an unforgettable journey into new realms. Of course all opinions and thoughts reflected are mine and mine alone. 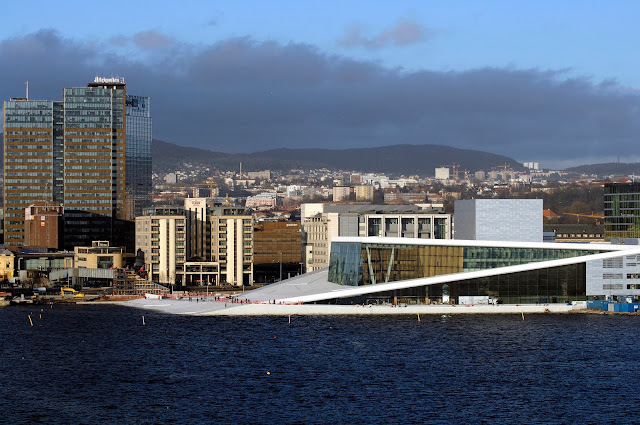 Thank you Viking Cruises! This is the perfect cruise itinerary for moi! It's one of my dreams to visit Bordeaux and I've loved this virtual tour and education about the wines and wine making of the region. I'll be better prepared for my real trip -- whenever that shall be. Hi there Cathy! Don't you worry my friend, your journey will come one day soon! Better bookmark this page for when the time comes!! It'll be here before you know it. Thank you so much for stopping by for for sharing your thoughts! Well, I don't need to tell you that this post is right up my alley! Chateaux, terroir, and wine...sigh. I have not been on such a trip in France but definitely have it on my list. I love to create similar trips here in California, though they don't compare to the opportunities for history and wine in France. Hi there Jenna!! I remember following along your journey in California wine country last year and loved every update. California wine country is certainly on my list. To date, I have only visited the Simi Winery a very long time ago and really need to get back soon! Thank you so much for stopping by my friend!! WOW! a very exhaustive post! And about red wine too. Yay! Margaux is my top favourite when it comes to wine. It was a good bottle that the awesomeness of Bordeaux was impressed on me. Thanks for this coverage and great photos, Jeff. I couldn't agree with you more Marlys!! Quite a long post indeed but I wanted to squeeze it all in. LOL! I have fallen in love with Bordeaux and can't wait to return one day soon to really experience the entire region. Thanks so much for stopping by and for your kind compliments!! Marcia, you are too funny! My work is done! ; ) I am so happy you enjoyed my post! I had a lot of fun putting together and although it is extensive, it really provides a great overview of what people can expect on their cruise, and more since mine was an abbreviated version. I long to go back soon! Yes, T&S should meet and tweet on a Viking cruise too! Wouldn't that be grand?! Thank you for taking the time to stop by and share your thoughts!! It certainly is my friend! Glad you like Marcia's idea as well!! Me too! Thanks so much for stopping by! That looks like a fabulous itinerary. 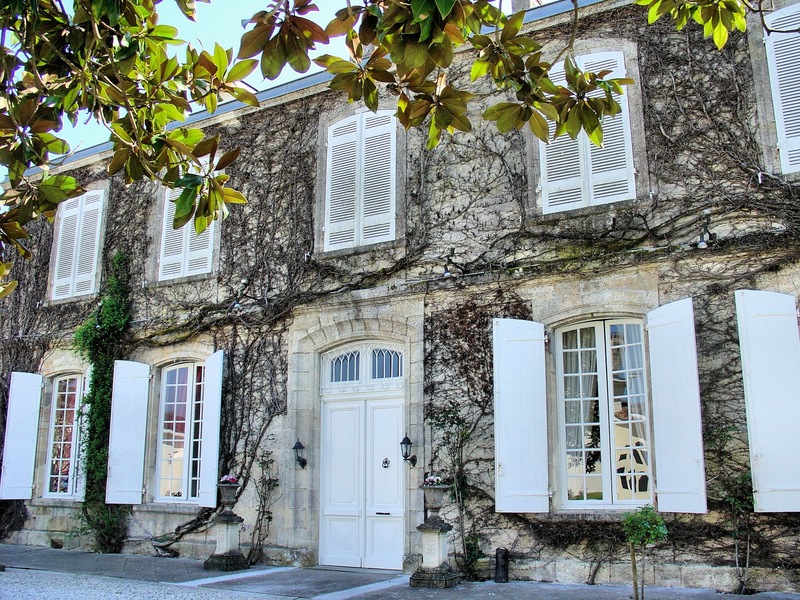 Stunning chateaux and some of France's finest wine, what's not to like? I couldn't agree with you more Brianna!! I love everything about Bordeaux!!! Thank you so much for stopping by and sharing your thoughts! Hi Jennifer! I can't thank you enough for all of your kind words!! I will have other posts from my trip including an article on Saint-Émilion. Will definitely check out your article too! Thanks so much for stopping by! What an incredible experience, Jeff! I want so badly to go on one of these river cruises - I guess I'll have to live vicariously through you until I get the opportunity!! I can't tell you how much I loved this entire experience! I have long wanted to visit Bordeaux and to experience the voyage with Viking was the icing on the cake!! Thanks so much for stopping by to share your thoughts! Amazing photos, Jeff. Thanks for posting that map of Bordeaux. The fact that Viking had a wine expert the calibre of Susie Barrie on board speaks volumes as to the quality of the Viking River Cruise experience. I couldn't agree with more about Susie! I have since befriended her and let me tell you that she is just as lovely in person as she is in the video above. Thank you again for stopping by and for your kind words!! My GF and I were fortunate enough to be on the inaugural cruise... a first cruise for both of us. To say that our experience was fabulous would be a gross understatement. While the weather didn't fully cooperate and there were some glitches in the itinerary (none of which were Viking's fault) the trips was one that we will remember always. The "wine experience" was wonderful. We learned much about the region and viniculture. And the food !!!!!! I have some of the same shots that you have posted. I especially enjoyed Saint Emillion. That beautiful town is exactly what I expected France to look like. Hi there Tom! I am so happy that you were able to cruise on the inaugural and despite the few hiccups along the way, your experience still exceed your expectations! WooHoo!! I too love learning about the region and the varieties of wines as you've read above, it surely is wonderful!! And delicious too!